Biotechnology Calendar, Inc. would like to extend our congratulations to our Quarterly Giveaway winner, David Winternheimer of Sanguine BioSciences. Sanguine BioSciences has won a free exhibit table courtesy of Biotechnology Calendar, Inc. By participating in Biotechnology Calendar, Inc. life science events and engaging with us on social media, exhibitors and attendees alike have the chance to win giveaway prizes and deals on events. Researchers at Biotechnology Calendar, Inc. life science events value our shows highly because we offer a comfortable, yet professional space where they can meet other researchers, discuss the progress they are making in their research and resolve the equipment issues they may be having that are slowing their research down. At our life science marketing events, researchers have discovered new lab products such as lab gels that save 15 minutes in the lab everyday and increase the speed of their research by hours every month. Researchers have also been able to find less expensive lab equipment that increases the buying power of their budget as well as green lab equipment that allows researchers to be environmentally conscious in the lab. Our free, catered lunches encourage a social atmosphere where researchers can enjoy themselves while talking with colleagues and learning about the latest and best lab supplies available on the market. Researchers are not the only people who enjoy Biotechnology Calendar, Inc. events. Exhibitors at our trade shows are able to meet researchers and hundreds of potential leads in the space of just a few hours. Our pre-show invitations assure large crowds at Biotechnology Calendar, Inc. life science events, and our advertising at each event puts lab suppliers’ company names at the front of potential customers’ minds. We also offer sponsorship packages that include pre-show web and print advertising, distribution rights to exhibit bags and seminar space. By exhibiting at our events, lab suppliers can increase lab sales through brand exposure and following through with leads. At the end of every event, Biotechnology Calendar, Inc. makes available a leads list that includes the contact information of attendees. This list is checked for accuracy, then double-checked to save sales staff time in following through with leads. With Biotechnology Calendar, Inc. leads lists, sales reps can follow up with attendees they met at the event whose contact information they may not have had the chance to collect. Sales reps can also contact researchers who they didn’t have the chance to meet at the event, but with whom they share the commonality of having been at the same life science event. Our leads lists are proven to help lab suppliers increase lab sales. 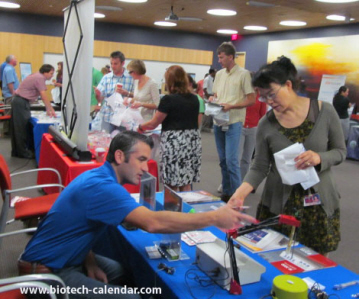 If you are a lab supplier interested in working to meet researchers and increase lab sales at Biotechnology Calendar, Inc. life science events, we invite you to view our 2014 calendar of events. Biotechnology Calendar, Inc. is a full-service science research marketing and events-planning company that organizes trade shows at top research universities nationwide. Our Fall Special prices are still available to exhibitors who register before November 1st, 2013. For more information on our Fall Special, please read our blog article Lab Suppliers Take Advantage of Fall Special Promotion to Get More Exposure. Congratulations once again to David Winternheimer and Sanguine BioSciences for winning our Quarterly Giveaway! We hope to see you on the web and at a Biotechnology Calendar, Inc. life science event again soon.